HWPH AG - Acciones antiguas - Associated Tea Estates of Ceylon, Ltd.
Associated Tea Estates of Ceylon, Ltd.
London, 21.11.1919, Verkaufsbestätigung für 100 Shares zu £ 237.10.0, o. Nr., 13,2 x 20,3 cm, schwarz, weiß, Knickfalten, Steuermarke, Stempel. 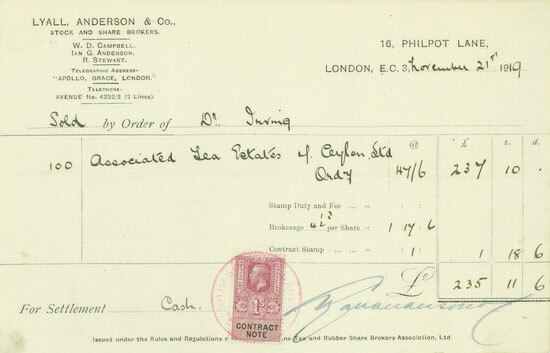 London, 21 November 1919, Receipt for 100 Shares sold at £ 237.10.0, o. Nr., 13.2 x 20.3 cm, black, white, folds, revenue stamps, stamp. Die am 16. Juli 1896 gegründete Gesellschaft besaß 1.687 Acres an Teeplantagen. The company was incorporated on 16 July 1896. It acquired 1,687 Acres of tea plantation.